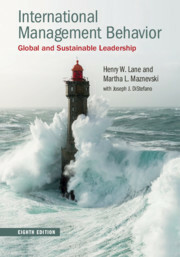 International Management Behavior Lane Henry W., Maznevski Martha L.
Authors: Lane Henry W., Maznevski Martha L.
Add to cart the livre of Lane Henry W., Maznevski Martha L.
Now in its eighth edition, this is the textbook for current and future global leaders wanting to lead competently and sustainably in their business practices. Fully updated, the authors build on their forty years of teaching, researching and working with managers worldwide to bring students the latest developments in global business practice. Now including end-of-chapter reflection questions to guide topic comprehension, and directed further resources to assist individual research, this edition also sees the return of Ivey Business School, Harvard Business School and IMD cases in the book. This edition also includes a new conception of mindful global leadership as the integrating framework for execution of global strategy, highlighting the importance of a holistic approach to working across cultures and distance. Combining a wealth of theoretical knowledge with real-world examples from diverse cultures, countries and industry sectors, the practical guidance and well-chosen examples throughout the book bring key concepts to life. Part I. The New Global Context: 1. Global leaders in the twenty-first century; 2. Mindful global leadership; 3. Understanding culture: through the looking glass; Part II. Leading People Across Contexts: 4. Interpersonal skills for international management: map-bridge-integrate for effectiveness at the point of action; 5. Leading global teams; 6. Talent management: selection, preparation and mobility of global leaders; Part III. Executing Strategy and Performance: 7. Executing global strategy: foundations; 8. Executing global strategy: applications; 9. Leading change in global organizations; Part IV. Integrity and Sustainable Performance: 10. Competing with integrity: personal integrity; 11. Competing with integrity: corporate sustainability; 12. Conclusion. Henry W. Lane is Professor of International Business and Strategy, D'Amore-McKim School of Business, Northeastern University, Boston. His research and teaching interests include executing global strategy, cross-cultural management, organizational learning and managing change. His Doctorate in Organizational Behavior is from the Harvard Business School. He serves as a faculty member for university and corporate courses globally. In 2009, he received the Academy of Management, International Management Division's Outstanding Educator Award for continuous excellence and innovation in teaching international management; and also the 2009 Academy of Management Review Decade Award for the co-authored article 'An Organizational Learning Framework: From Intuition to Institution'. Martha L. Maznevski is Professor of Organizational Behavior and Faculty Co-Director for Executive Education at Ivey Business School, University of Western Ontario. Dr Maznevski completed her Ph.D. at Ivey Business School with research on multicultural teams, and is an expert on global teams, global leadership, culture and identity, and empowering individual differences. She has published widely on these topics in academic and management arenas. She works closely with leaders and their organizations around the world on innovative approaches to achieving sustainable performance across levels, industries and organizational types in today's highly complex global environment.